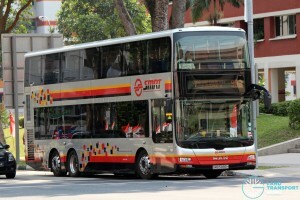 SMRT Bus Service 983 is a trunk service operating from Choa Chu Kang Bus Interchange and looping at Jelebu Rd, passing through Choa Chu Kang Avenues 4, 5, 6, 1 & 7. 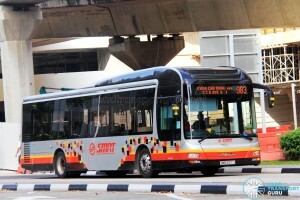 Service 983 was launched on 25 April 2015 along with the introduction of feeder Service 301 and amendment to feeder Service 300, and is the 40th bus service introduced under the Bus Service Enhancement Programme (BSEP). The revised launch date (originally 15 Feb 2015) was in response to feedback by residents of Choa Chu Kang. 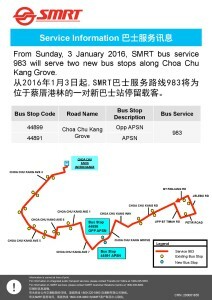 Service 983 serves the new Choa Chu Kang Bus Interchange from 16 December 2018. 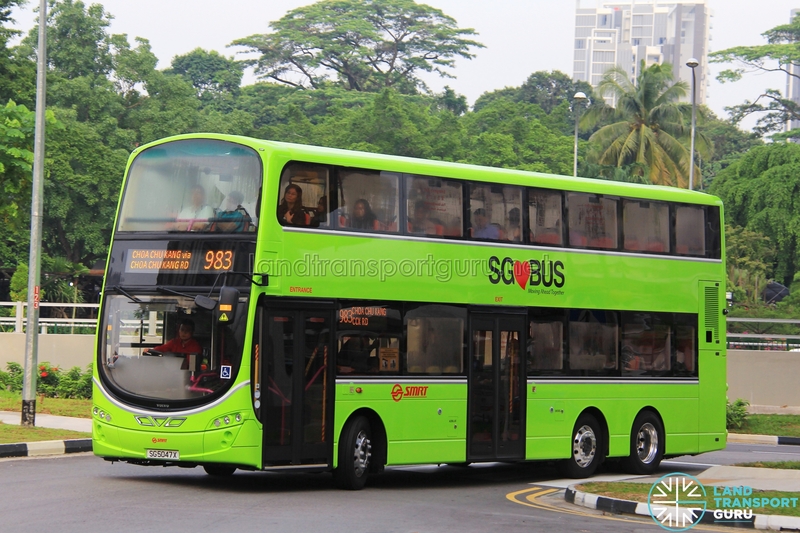 Service 983 provides residents of Choa Chu Kang Neighborhoods 2 and 4 with greater connectivity to transport nodes at Choa Chu Kang and Bukit Panjang, namely the MRT/LRT stations and bus interchanges at both ends. It also serves various schools and other amenities in the neighborhood, such as Lot 1 Shoppers’ Mall, Bethany Methodist Nursing Home, Concord Primary School and Bukit Panjang Govt High School, APSN (Delta Senior Sch) and Bukit Panjang Plaza. 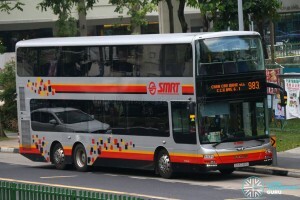 Initially introduced on 25 Apr 2015 as the fortieth (40th) service under the Bus Service Enhancement Programme (BSEP), it was a short trunk service serving Choa Chu Kang Ave 4 and 5 and looping at Keat Hong Close. 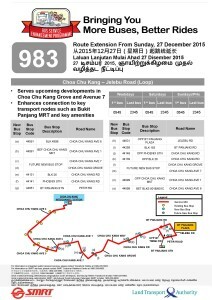 From 27 Dec 2015, to compliment the opening of the Downtown Line Stage 2, Service 983 was extended to loop at Bukit Panjang, via Choa Chu Kang Ave 6/1/7, CCK Grove, CCK Way, CCK Rd, Upp Bt Timah Rd, Petir Rd and Jelebu Rd. The current Service 983 benefits residents of newly-built residential developments in the area, namely the HDB Bulit-to-Order (BTO) developments of Sunshine Gardens, Keat Hong Crest, Keat Hong Pride, Keat Hong Axis and Keat Hong Colors. 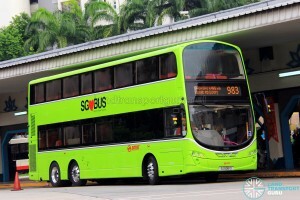 Originally intended to be launched on 15 Feb 2015 as the thirty-eighth (38th) BSEP-introduced bus service, negative feedback from Choa Chu Kang residents led to the postponing of the launch along with the accompanying Service 301 introduction and Service 300 amendment to 25 Apr 2015. The route was not amended, but a pair of bus stops along Keat Hong Close had been removed as new housing developments in the area are still under construction, and the route will potentially no longer serve Keat Hong Close once the service is extended to Bukit Panjang. 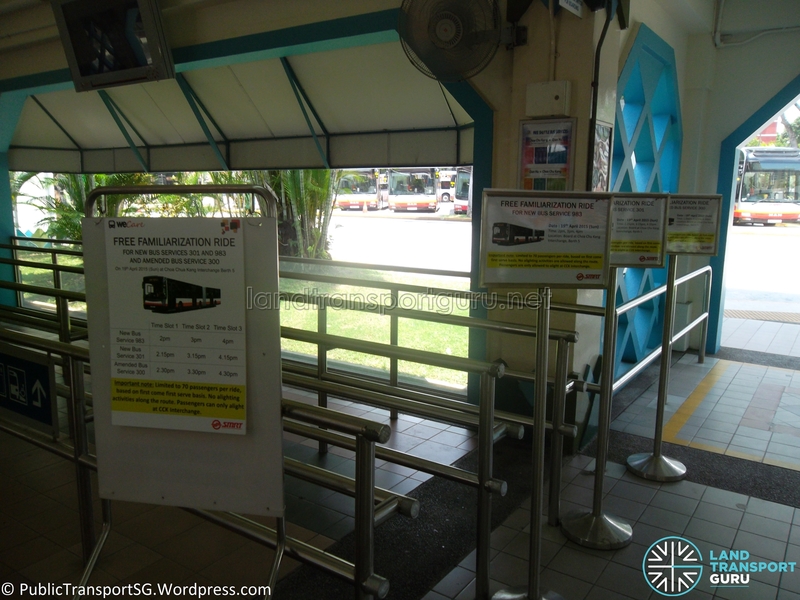 SMRT organized a free familiarization ride for the new Service 983 on Sunday, 19th April 2015, a weekend before the launch date. 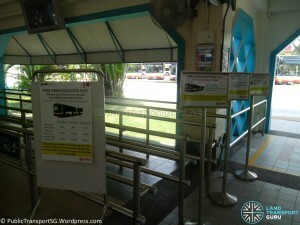 Three trips were operated, departing Choa Chu Kang Interchange (Berth 5) at 2:00pm, 3:00pm and 4:00pm. 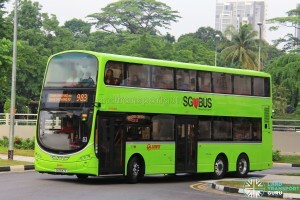 The trip plied the full route of Service 983 without making any enroute stops. 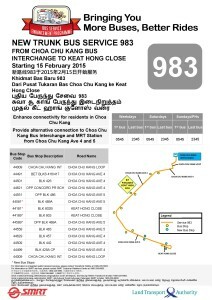 Originally a loop service from Choa Chu Kang to Keat Hong Close, Service 983 was extended to loop at Bukit Panjang from 27 December 2015, via Choa Chu Kang Ave 6/1/7, CCK Grove, CCK Way, CCK Rd, Upp Bt Timah Rd, Petir Rd and Jelebu Rd. 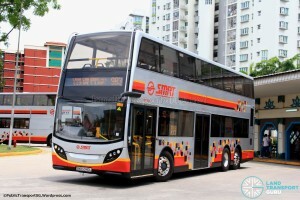 The route amendment brought improved connectivity to new housing estates at Choa Chu Kang by connecting them to the transport node of Bukit Panjang, with additional bus and rail connections available as part of the DTL2 Bukit Panjang Service Enhancements. The route extension was the fifty-fourth (54th) route amendment / new route under BSEP. 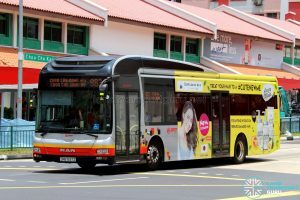 As part of the Bukit Panjang ITH Opening Route Amendments, Service 983 was made to call at Aft Bt Panjang Stn along Upp Bt Timah Rd, while skipping bus stops at Petir Rd (Bt Panjang Stn) as well as Jelebu Rd (Opp Bt Panjang Plaza) from 04 Sep 2017. 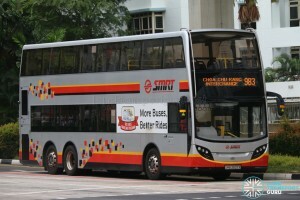 Weekdays & Sat: 0525hrs until first bus from CCK Int at 0627hrs. Fare: Charges basic distance fares for trunk services. See Bus Fares. 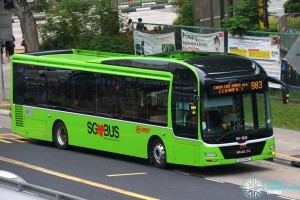 The Bus Service Operating License (BSOL) for this route will be renewed in 2023 under the Choa Chu Kang – Bukit Panjang Bus Package. 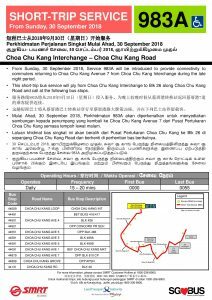 2015 (02 Feb): Announced as a trunk service from Choa Chu Kang to Keat Hong Close (Loop) under LTA’s Bus Service Enhancement Programme (BSEP), to be launched on 15 Feb 2015. 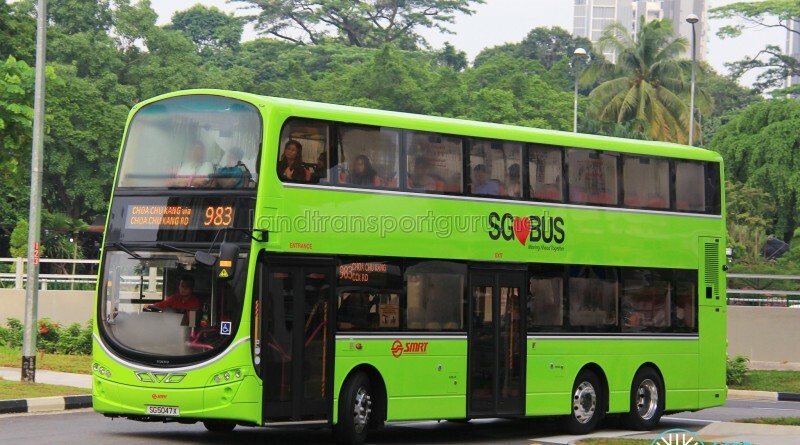 2015 (25 Apr): Service 983 launched as a trunk service from Choa Chu Kang to Keat Hong Close under LTA’s Bus Service Enhancement Programme (BSEP). Alexander Dennis Enviro500 Double-deckers are deployed to this service. 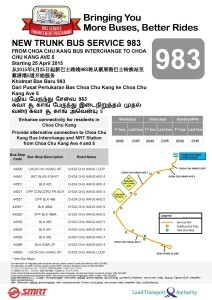 2016 (24 Apr): Starts calling at an additional pair of bus stops along Choa Chu Kang Avenue 7. 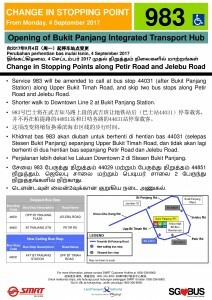 2017 (04 Sep): Skips bus stops along Petir Road and Jelebu Road while calling at Upp Bt Timah Rd as part of Bt Panjang ITH Opening Bus Service Amendments. 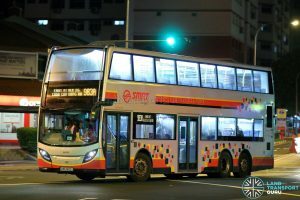 2018 (30 Sep): New Short-Trip Service 983A introduced, to operate daily during the late night period. 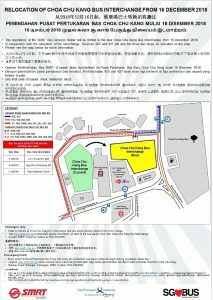 2018 (16 Dec): Calls at relocated Choa Chu Kang Bus Interchange. 2015: No significant route changes since 2015.